Hi guys! I hope everyone is having a great week! Mine, although nice, has been extremely busy with no sign of slowing down (story of my life!) It’s funny because I feel like being totally lazy in the kitchen, but at the same time those long, hard days are the times when I need to nourish my body, mind and soul the most. Nothing says “ok, you can relax now” like a delicious home cooked dinner with your loved ones (or by yourself! I actually love a quiet meal ALONE sometimes!) Over the years I have been cooking, I have learned that you can have both – the very little effort in the kitchen & the delicious home cooked meal. Although I cook with the seasons, (especially where produce is concerned – this is why you will see similar ingredients from my recipes for a while then a total change up all of a sudden), I also have several go-to easy recipes that can make everyone at my table enjoy their dinner even when my energy level is on the low side. I am a huge fan of marinades. They are a perfect way to get intense flavor throughout your food while keeping the labor part to a minimum. They sell pre-marinated meats and bottles of marinade in the stores, but I’m really not into them. First of all they are LOADED with salt (and probably not the good kind), preservatives, and sugars. Although the initial investment on ingredients might be an extra $20 or so bucks on your grocery bill, each marinade you make will literally be pennies. You can take that $20 and make 6 – 12 marinades, sauces, vinaigrettes, etc. Not only that, but you can make them exactly how you and your family want them to taste. It will be better for you, AND will definitely taste better. My husband is a lover of barbeque sauce. He buys bottles of it all the time (I think we have about 6 in the cupboard right now). But those bottled sauces are so heavy! Sometimes I feel like all I can taste is the sauce; even if it tastes good, I want to taste the meat too. So I came up with my own recipe for a BBQ sauce. It’s kind of a combo between a sauce and a glaze. It’s sweet, it’s tangy, and it’s very sticky. I like to use both the marinade and sauce on the same meat. 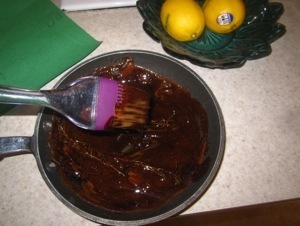 The marinade acts as a flavor injector and also a tenderizer. It puts that flavor on the inside. And the sauce puts it on the outside. It’s sticky and gooy-ness makes it feel luxurious and delicious. Both my husband and daughter are always happy when this lands on their plate. It’s a perfect summer dish. Both of these can be used for grilling outdoors or in the oven. I wrote the recipe for the marinade & sauce without instructions for meat. The reason being that it can be used for anything – even some firm tofu would be delicious! I am doing it with chicken so I will give some instructions on how I am cooking that, and my directions can be applied to most other meats. As usual you can change up any amount or ingredient unless specified. This would be fantastic on grilled salmon or pork. Obviously chicken is great. Shrimp is cool. If you wanted to serve it as an appetizer you could use little chicken drumettes. Kebobs would be awesome with veggies and even pineapple! You can double or triple these recipes easily with very little extra effort. So let’s get cooking! Note: This recipe works for any kind of protein you like, about 4 pieces, 6-8 oz. each. 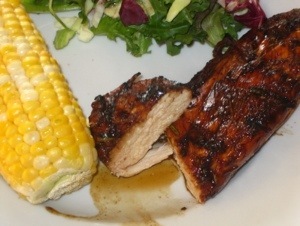 For this blog entry I am using chicken breasts. I have used this on bone-in with skin, skinless & boneless and thighs & breasts. All are delish and fabulous. This is what is going to make the meat so tender. The acid in the vinegar is a big help with that. Trader Joe’s has great balsamic vinegars all the time. You do not need a fancy one. This will add some savory that will balance out the balsamic sweetness. It will also lend a hand with tenderizing. You really can use any oil you like here. I am really into Costco’s Mediterranean Blend right now. It’s like 12 bucks for a gallon and has a combination of wonderful oils from that region. You actually don’t technically NEED to add oil. I do for a couple of reasons – it helps keep the vinegar from breaking down the meat too much (good to know if making it way in advance or using already very tender meat); it also helps the meat (and sugars in the marinade) from sticking to whatever I am cooking the meat on/in. You can also use dried rosemary (about a tablespoon I’d say). If you have other fresh or dried herbs on hand that you’d like to add, then go for it! The pepper is to your own taste. Just a tiny pinch of kosher salt is needed to help out the marinade. Remember we added soy sauce already! In the sauce this will add both sweetness and tang. 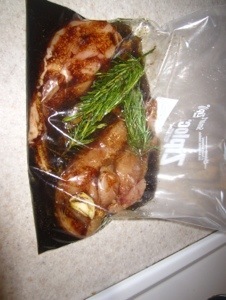 Since we used it in the marinade it will pair the inside & outside of the meat perfectly. Again, flavor pairing but this will also help the sauce not be too sweet as we are using some very sweet and intense ingredients. I just love honey, don’t you? I like to use local honey, but use whatever you like as long as it’s good. The flavor of honey can greatly vary depending on what pollen the bees are into. This is going to add the stickiness, more sweetness, a rounded slightly floral flavor and lots of SHINE. Combining both will add a sweet & sour layer to the sauce. You can also just do one or the other. Pineapple would be delish as well. This will add some sweet heat and aroma. Ginger would be fantastic as well. This will add spicy heat. By the way, did you know that dried spices can go bad? If you have a jar of this and the flakes are a brown shade or anything NOT bright red then they have lost their potency. I like to do this part the night before or in the morning. It only really needs about 20 minutes to get the job done but you can marinate your meat for up to 36 hours, and of course the longer it sits the better it gets! If you are doing any kind of fish or seafood I would keep it at 20 minutes though. Smash and peel garlic cloves. Leave whole or chop up to your preference. I love a ton of garlic flavor (more than most people, but I put amounts that most people like). You can add or omit as much as you want. Leaving it whole will give it a nice background flavor & aroma. The more you use and the more finely you chop it the more center stage it will become. In a large freezer bag or sealable container, combine all ingredients. Add your meat and make sure it gets completely coated. Seal & refrigerate a minimum of 20 minutes but up to 36 hours. This is going to sound weird, but once the bag is sealed from the outside, massage your meat! This will help begin the tenderizing process as well as wake up the meat to invite the flavor in. Remove when ready to cook. This sauce CAN be made in advance and stored in the fridge for up to a month if sealed properly. I like to use mason jars. It will be harder to work with the colder it gets, so I would take it out of the fridge at least an hour before using (if you take it out the night or morning before it will be just fine). When I have forgotten to take it out I just spoon some into a sauce pan and heat on low until ready – about 5 minutes. Combine all ingredients in a small sauce pan. Gently bring to a boil over medium-high heat. Once boiling, reduce heat to the lowest temp that will keep the boiling going. Let boil uncovered until liquid is reduced by half. What we are doing is called reducing. We are literally evaporating the water OUT of the sauce. Make sure the boil doesn’t get out of control, but you don’t have to watch it every second either. Just check it every few minutes. When it’s ready it will be thick and sticky and intensely flavored. Perfect! I almost completely cook my meat, and then when it is about 5 minutes from fully cooked I use a pastry brush to glaze some sauce on all sides. If you don’t have a pastry brush, just use a spoon. Then I apply another couple of coats when the meat is finished cooking. For garnishes I love to use sesame seeds and/or fresh chopped parsley or basil. Thank you for reading my recipe! I will also be including a printable version of this recipe without all my witty repartee (ha-ha!). I hope you enjoyed it enough to try it!